New York's Chelsea Hotel has long provided refuge and inspiration for artists and musicians, and now some of the doors that enclosed famous residents have been sold off at auction. Amongst the collection of doors was one from the room Bob Dylan stayed in, which sold for a whopping $100,000 USD. The door to the room where Leonard Cohen and Janis Joplin once had an affair (widely believed to have inspired "Chelsea Hotel No. 2"), meanwhile, sold for $85,000. That was the same price tag on the door to Joni Mitchell's old room. The door to the room where Edie Sedgewick stayed (and where Andy Warhol shot Chelsea Girls) sold for $52,000; the door to the room where Jack Kerouac wrote On the Road in the 1950s sold for $30,000; and the doors to the rooms of Jimi Hendrix and Madonna sold for $13,000 a piece. The doors were preserved, archived and sold by former tenant Jim Georgiou. He began saving them in 2011, and managed to restore 50 of them. "For me they were history and beauty and connected to my heart," he told the New York Times. "They're precious because there are so many people who've been through them." 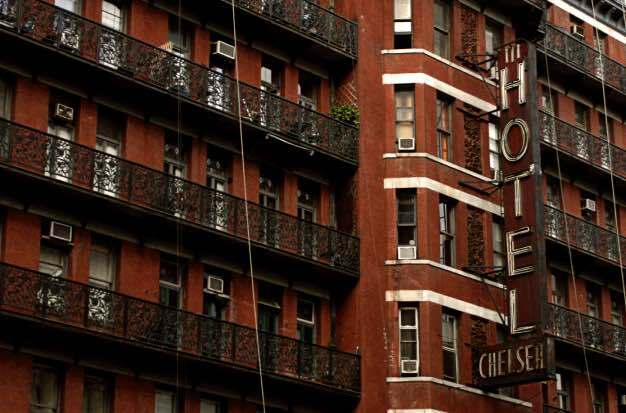 The Chelsea Hotel was designated a New York City landmark in 1966.